Do you want to share your hearthstone playing with the world? There are a lot of reasons to do so. Of course, the most obvious is that you might become the next Twitch / Youtube celebrity, but realistically, that takes as much luck as it takes skill, screen presence and plain hard work. But the best reason to do it is because it can be a lot of fun. Games are inherently more pleasing when they are shared with others, and while the anonymous comments in Youtube are usually trash, your friends in social networks such as Twitter or Facebook will often enjoy watching your epic wins and sympathize (or laugh at – sometimes friends are like that) with your epic fails. Plus, people commenting on your mistakes will invariably lead you to become a better player – even if it may sting sometimes. Streaming is also easier than you think – and free! Let’s get this show on the road. The first thing you want to do is pick where you want to share your videos. You can easily record gameplay video to your desktop and upload it to Twitter or Facebook, but that’s not live streaming. For live streaming, your best bets are Twitch.tv and Youtube. It’s possible to stream to both at once but it’s way too complicated and it places a huge load on your computer. Oh, right, you need a computer to do this, by the way – there’s not any way that I’m aware of to stream from Apple tablets or phones. The Youtube Gaming app theoretically lets you do so from your android phone, but that’s a whole other guide in itself. And I don’t own a Mac so this guide will be Windows-focused. Sorry, Mac users – you can refer to the OBS guide down below and hopefully most of my directions will translate, but I can’t confirm. Anyway, there’s pros and cons to both streaming video services, but overall they are pretty evenly matched, so it comes down to your personal preference. If you intend to earn money from your streaming down the road, Twitch will probably lead to less headaches, but you will also need to build a larger audience. But if you are doing this just for fun – and at the start, you should be, otherwise you will lose interest fast – you should spend an afternoon with both websites and see which one you like the best. Personally, I like to use Youtube, because it makes it quite easy for me to maintain an archive of my streams, and I also do a lot of non-live video which works best there. But I also do a lot of my streams in Portuguese, and Twitch is not half as popular in Portugal, so if I was in the US or UK I might go a different route. 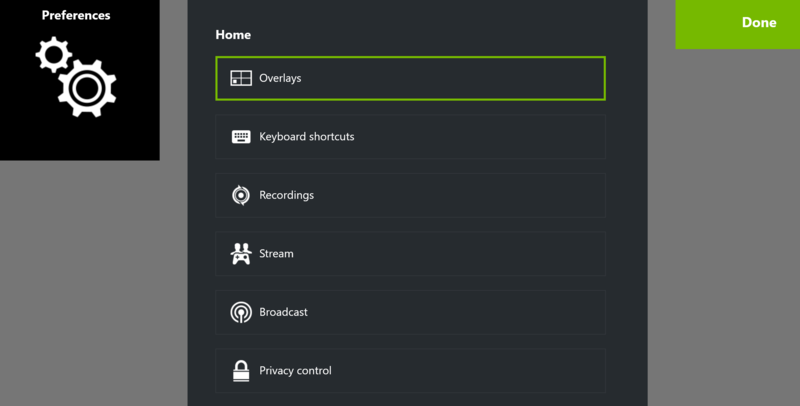 GeForce Experience is more often advertised as a tool to optimize individual game settings for your NVIDIA graphics card, and to be honest it isn’t especially great at that, but it is secretly one of the easiest to use video streaming apps out there! You’ll want to grab the beta version from GeForce’s official website, because the beta has the most advanced streaming support. After installing and opening it, select the “My Rig” tab in the top portion of the window. This will let you check if your PC has the hardware to properly stream. If it says no, don’t despair – jump to the next section and learn how to setup OBS Studio, which has lighter hardware requirements. Assuming that your PC is up to scratch, next you’ll want to go input your Twitch / YouTube info into the GeForce Experience software. This is done by pressing the little arrow to the side of the “Share” button on the top right side of the screen, and choosing “Connect”. There, just click on the icon of your streaming service of choice, and input your username and password. 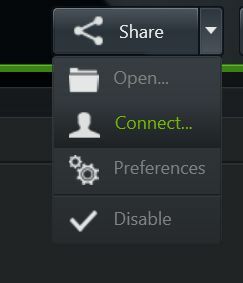 That’s it for connecting – one of the key advantages of GeForce Experience is that you don’t need to worry about finding and inputting server / streaming key info. We’re not done yet, though. On the same menu where you clicked on “Connect”, you’ll have to go to “Preferences”. This will open up a new window, actually, a semi-transparent “overlay” that will fill most of your screen. From here, let’s go to “Overlays” first. This is where you get to choose what is displayed in your stream in addition to your gameplay. Let’s keep it simple for now and turn everything off except for your “Status Indicator” (so you know the stream is working) and maybe your camera, if you have one and fancy people seeing you while you play. Next, go back to the preference screen and pick “Broadcast”. 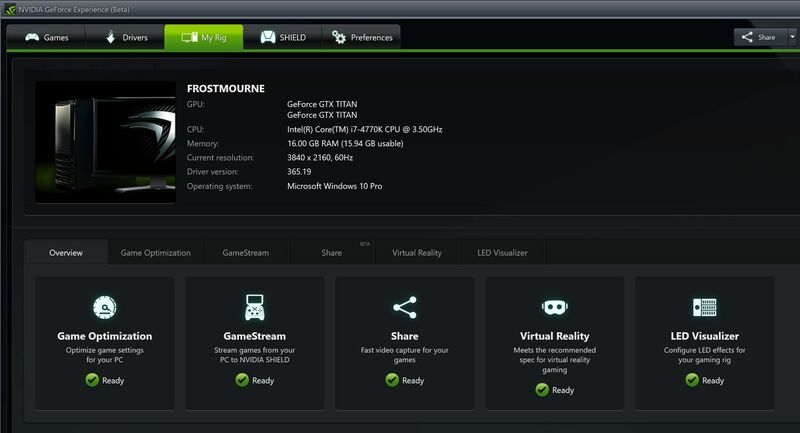 Not “Stream” – I know this is confusing, but in NVIDIA’s terminology, stream is not actually streaming video, it’s sharing a game with one of your buddies. On the broadcast section, simply pick between Youtube or Twitch depending on the one you’ve log in to previously. If you choose Twitch you’ll also have the option to pick the broadcast server, but that’s usually well enough left on the default option. Finally, go back to the settings screen one last time, and go to “Privacy Control”. 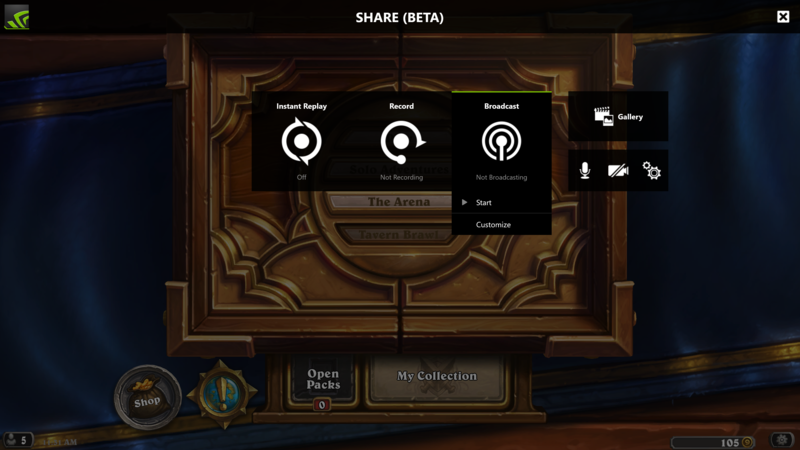 Here you’ll have a single option: to turn on “Desktop Capture”, and you need to turn this on, because hearthstone runs by default in borderless fullscreen mode and the app won’t be able to capture video from it unless it has access to your desktop. We are almost done! Now all you have to do is start Hearthstone, and when you are ready to stream, press “ALT+Z”. 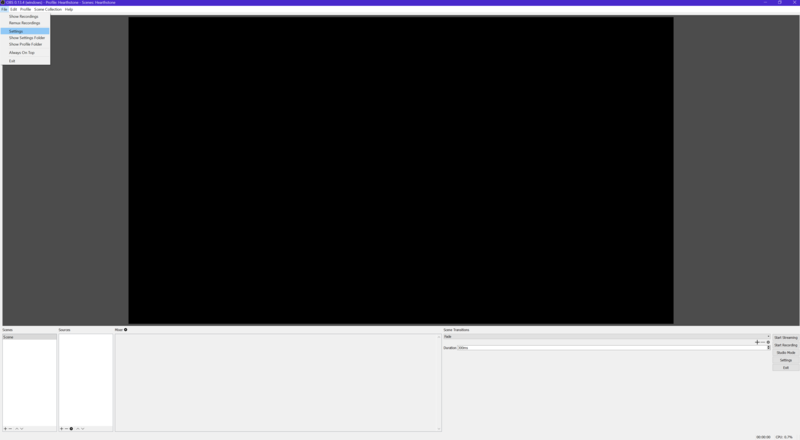 The Overlay will show up again, and here just click “Broadcast” and “Start”. Alternatively, you can avoid going into the overlay by just pressing Alt+F8 once you’re in-game, and the streaming icon should pop up on the lower-right corner of your screen. OBS Studio is the newest version of the most popular free streaming tool and while it isn’t as user-friendly as NVIDIA’s solution, it works with most graphic cards and is much more powerful in terms of the kind of things you can do once you decide to get into advanced streaming. You can get it here. It also works on Mac, though I have no experience using it there. The first thing you want to do in OBS is configure it to reach your Youtube / Twitch account. To do that, you need to provide it with a code called a “stream key”. You can get your Twitch stream key by logging into your Twitch account, navigating to your dashboard, and into the “Stream key” section. In YouTube, the stream key can be found by navigating to https://www.youtube.com/live_dashboard . At the bottom of the page you can press a button to reveal it. It also details some server info but OBS has that in automatically, so don’t worry about it. Now open OBS and go straight to the File Menu, then select Settings. Click “Stream” on the sidebar of the window that pops up, pick either YouTube or Twitch, and paste your Stream key into the appropriate text box. 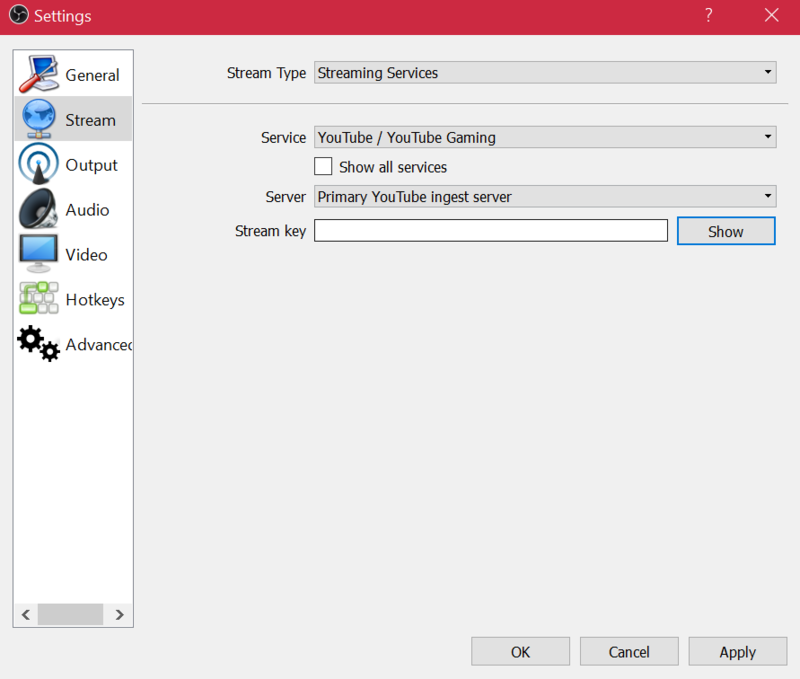 OBS will choose the appropriate server for YouTube automatically; for Twitch, choose the one closest to your location from the drop-down menu on that same window. Now your OBS is configured to stream to your streaming account. Next, we’ll configure your microphone. Assuming your mic is properly connected, all that you need to do is go to the “Audio” tab on the settings window, and choose from the drop-down menu labeled “Mic / Auxiliary Audio Device”. 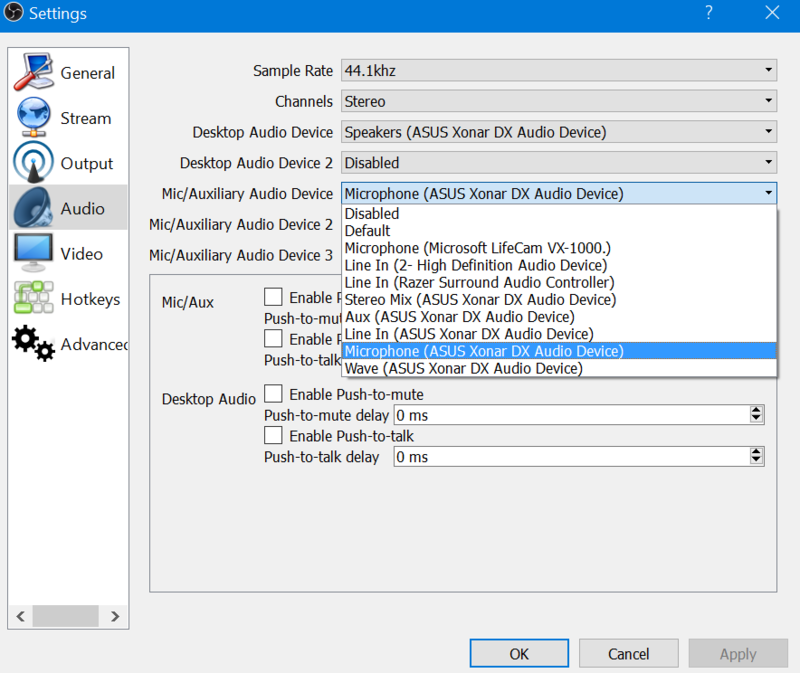 Your computer might have several audio input ports, so you may need to test a bit to see which is the right one. This is easy: once you assign one in this menu, the “Mic/Aux” line should appear in the “Mixer” section at the bottom center of your OBS window. If the green bar moves when you talk, this means the mic is capturing your voice! All that’s left now is to tell OBS how to capture the hearthstone window. To do this, open Hearthstone, then ALT+Tab back to OBS. 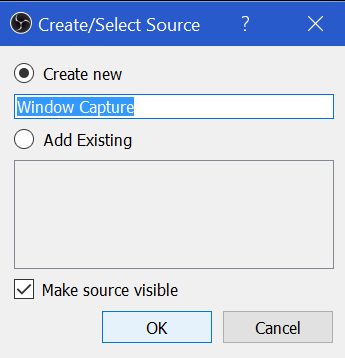 Right-click the “Sources” box near the bottom-left corner of the screen, and choose “Add”, “Window Capture”. It will prompt you for a name for the new Window you want the software to capture. I’m really original with my naming so I wrote in “Hearthstone”. After you input the name of your source, press “ok” and you will get to choose from a dropdown list the window you want. If you have hearthstone open in the background, you will be able to select it. Do so now. 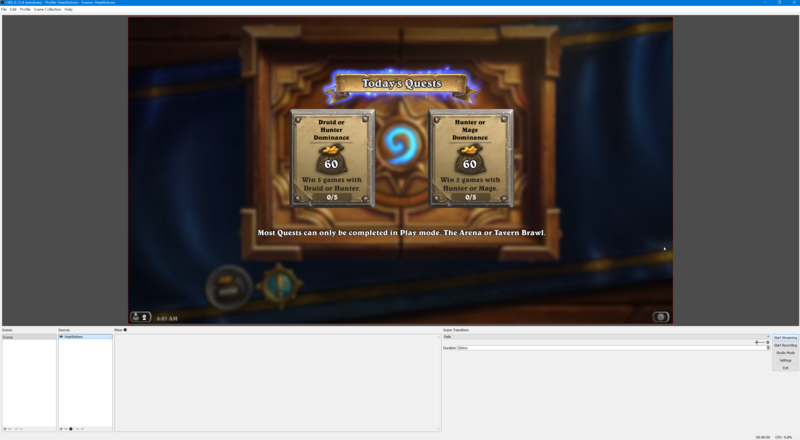 The main hearthstone screen should now show up inside OBS – you’re good to go! 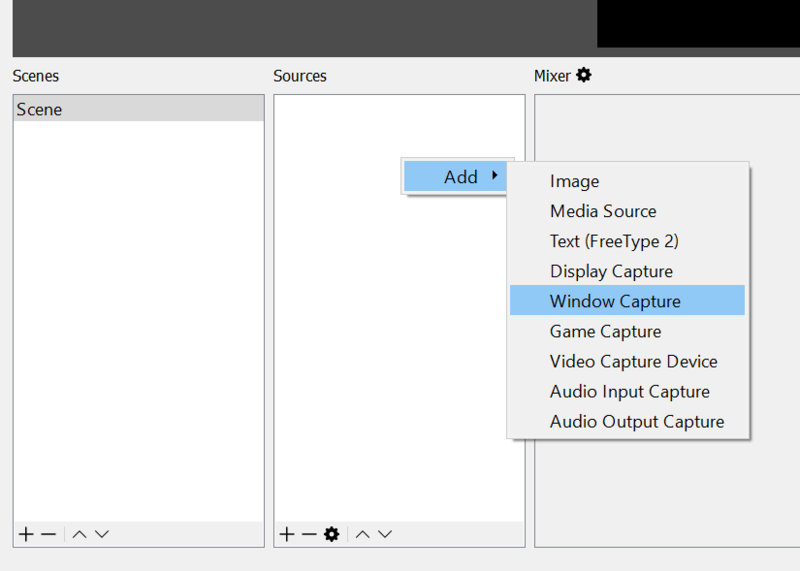 If you have a webcam available and want to use it as well, just repeat this last step but instead of choosing “Window Capture” from the “Add” menu, choose “Video Capture Device”. If your cam is set up properly, it should pick up the signal automatically. Just press “Start Streaming” on the menu to the bottom-right corner of the OBS window, and ALT-Tab back to Hearthstone. Congratulations! You are now streaming – have fun! By the way, OBS auto-saves all of this, so next time you just need to open Hearthstone, open OBS and click “Start streaming”. Hopefully this beginner guide has helped you setup the basics of streaming. Let us know if you have any questions in the comments down below. I’m no technical wizard so I can’t promise to be able to help with everything, but I’ll give it a shot – and if all works out for you, maybe you can help someone in the comments as well!